The gracious, old house, which overlooks Petpeswick Inlet, was built before 1861 by John Anderson, grandson of John Anderson, Senior, who brought his wife and nine children: Peter, James, Jock, Ann, William, Charles, George, Jobina, and Sandy to this area from Scotland in 1819. John Henry Anderson (1833-1908), son of George, married his cousin, Jane Anderson. They had no children. Since Jane's death in 1929 at the age of 94, the property has had a number of owners: Strong, Rowlings, Mattatal, Dixon, Tilley, Hoar, and now, Flewwelling. The property was once the site of a large farm, and the wharf site located across the West Petpeswick Road was once a hub of shipping activity. The schooner, "The Jane Anderson" was built and launched on this shoreline. The main part of the house is original. There are old wood ceilings, inside shutters, and Scottish dormers. The old front door has the original cross panels and there is a tin ceiling in the pantry. The lovely, long stair rail to the second floor is reminiscent of the grandeur that has spanned one and a half centuries. 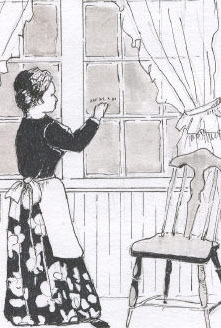 Jane Anderson engraved her name and the date, June 13, 1861, on one of the kitchen windows. The house is a registered County Heritage Home. When Jane Anderson carved her initials and the date, June 13, 1861 on her kitchen window, did she envision the women and men who would come to her homestead through the years bearing timeless and treasured items of Eastern Shore craftsmanship? The Old Anderson House Craft Shop and Art Gallery opened in the summer of 1980 when a small group of Musquodoboit Harbour women saw the need for an outlet to serve local craftspeople. Joan Flewwelling, Vicki Dunbrack, Marina Withers, Margaret De Jong, and Kitty Beatie, started a small craft barn and art gallery in the old barn on the Flewwelling property. The shop has grown in the intervening years and is now a two-story art and crafts gallery. Maintaining its original warmth and charm, the gallery offers elegant crafts in a wide variety of stitches, designs, styles, and medium. Every item is handmade locally. With the continued support of Joan Flewwelling, owner of the Anderson home, the co-operative volunteers, and over one hundred artisans, the Anderson House Craft Shop and Art Gallery is now in its thirty second year of operation and is one of the finest sources of Maritime crafts in the province. Why do customers from near and far keep returning and bringing friends and relatives? The relaxing and friendly ambience is one of the drawing features of our gallery. Customers take purchases home in brightly crafted bags stitched by our own Bag Ladies. The memory of vibrant colours and beautiful materials and creative art, the work of busy and capable hands, stays in the mind long after the visit.